On Wednesday, January 29, 2014, the Thai Public Health Ministry (MoPH) passed a resolution calling for the immediate prohibition on the use of chrysotile asbestos, the only form of asbestos still legal in Thailand.1 The next day (January 30), members of the Thailand Ban Asbestos Network (T-BAN) met with a ministry official to discuss developments and request documentation about the decision to outlaw asbestos use.2 Welcoming renewed government support for banning asbestos, T-BAN Coordinator Mrs. Somboon Sreekumdokkae urged politicians and officials to work alongside civil society campaigners on a coordinated program to raise asbestos awareness and decontaminate the national infrastructure. Since T-BAN was established two years ago, it has been closely monitoring the governments progress towards honoring a three-year-old commitment to ban asbestos.3 Unfortunately, the 2011 ban asbestos resolution adopted by the National Health Commission set off a huge backlash from foreign as well as Thai asbestos vested interests. It has been alleged that Russian asbestos lobbyists exerted financial and political pressure on Thai civil servants and medical experts to overturn support for the ban asbestos policy.4 While it now appears that they have not succeeded, it is not unreasonable to believe that their efforts contributed to the three year wait for action. 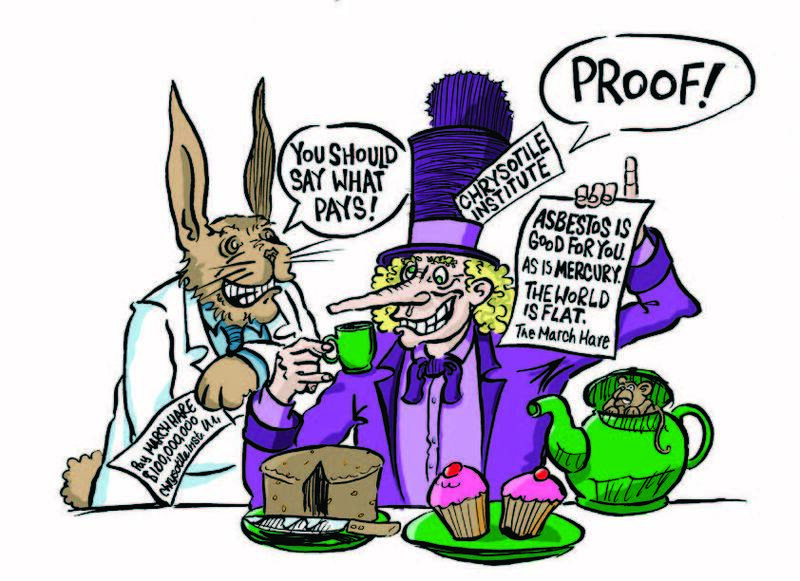 An Alice-in-Wonderland scenario which unfolded during the MoPHs asbestos deliberations may very well be related to this pressure. Recently, Dr. Chanwit Tharatep,5 Chair of the Working Committee on Asbestos since it was set up in 2010 to study the asbestos health hazard, reported that there was no evidence in Thailand to justify a national ban. According to Tharatep, the risk from asbestos was similar to that from other hazards such as smoking cigarettes or eating fried pork, neither of which is prohibited. Members of the Asbestos Working Committee, at least those who had not resigned because of the Chairs intransigence, contested Tharateps conclusion saying it was not reflective of the committees findings. It seemed that the ban on asbestos had become a political football rather than a health issue as Dr. Tharatep appeared to be following the Ministers political dictates rather than the scientific evidence. On February 1, an article in the Bangkok Post said that Tharatep vehemently denied claims asbestos companies had lobbied him. Further compounding the disquiet over the contentious Tharatep asbestos report, was the failure to make its contents public. 1 Wangkiat P. Narong backs outlawing all asbestos. February 1, 2014. 2 TBAN Press release. Thailands Ministry of Health Informs T-BAN of Support for Asbestos Ban. January 31, 2014. 3 Kazan-Allen L. Progess on Thailand Asbestos Ban. April 26, 2011. 4 Although asbestos consumption fell in Thailand by 29% in 2012, the latest year for which figures are available, Thailand remains a substantial asbestos user and is of strategic importance to the global asbestos lobby. See: Kazan-Allen L. Growth of Asian Asbestos Markets. June 14, 2013. 5 Dr. Chanwit Tharatep is also Health Deputy Permanent Secretary of the MoPH.